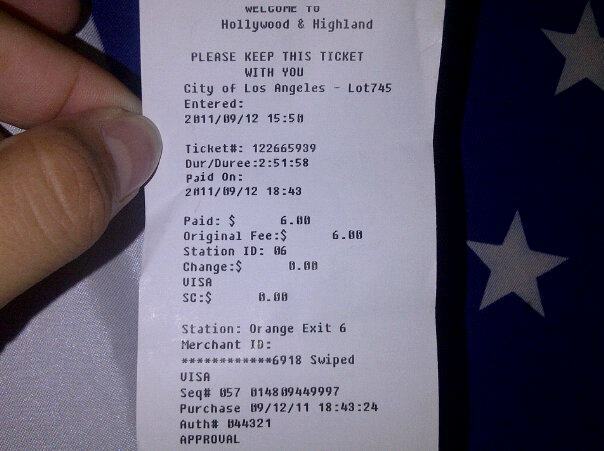 Today Monday, September 12, 2011 I went to cover an event at The Grill on Hollywood Blvd inside the Hollywood and Highland Complex and I was there less then 2 hours and when I was driving to pay with my validated parking the attendant say it was $6.00 and I told him the my ticket was validated and he say that you need to pay after 2 hours? If you see the photo it says the you pay only $2.00 dollars with validation after 4 hours. I am so sick of Hollywood and Highland Complex because they always rip-off people and they do not care. Like this person who charge me he even did not wanted to accept cash for the payment. He is a lazy employee who say he did not care about me writing and complaining about this terrible experience. So I ask you not to park at the complex any more, take the bus or ask somebody to drop you off. By doing so, the parking company will not get enough customers to park there and they will loose their jobs. Also the will affect the business owners of the complex but the fault is on New South Parking staff who do not care about your complaint. This guy (male) say he was doing his job. They event blame the business owners, not sure if business owners do not want to pay for their customer parking but hey that’s a business expense for them and they can write it off when they pay their business, state and federal taxes. 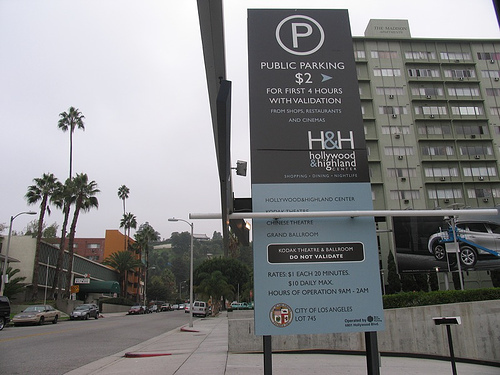 For your information: The underground parking facility for the Hollywood and Highland complex is operated by New South Parking, a partnership between the largest parking company in North America, Central Parking (HQ in Nashville) and Global Parking Systems (HQ in Indianapolis). The logo is Central Parking’s. As of June 30, 2007, Central Parking operated approximately 3,000 parking facilities containing approximately 1.4 million spaces at locations in 37 states, the District of Columbia, Canada, Puerto Rico, the United Kingdom, the Republic of Ireland, Chile, Colombia, Peru, Spain, Switzerland and Greece. So I can tell you from now on I will avoid to park in the complex.